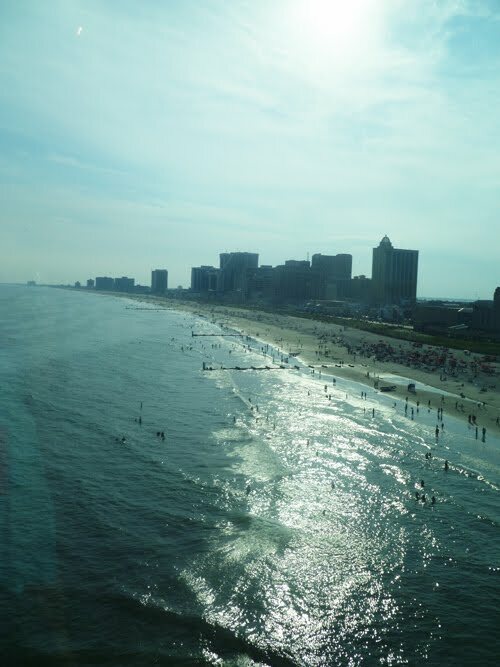 The second day of the Food Network’s Atlantic City Food & Wine Festival was filled to the brim with events. I had a hard time deciding where to go, but finally narrowed it down – to seven. Considering I had my daughter Sam along to help me taste, note and photograph, I thought I could handle it. 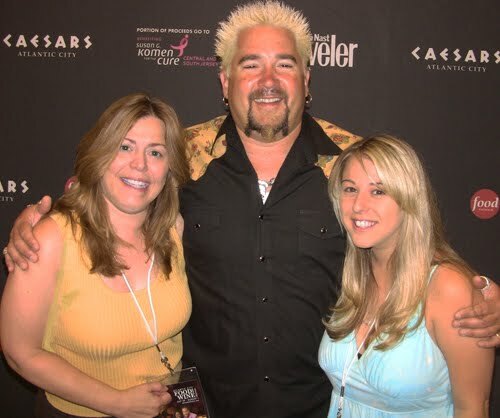 I started off joining three other writers for an informal interview with Guy Fieri. Why he is called the “bad boy” of the Food Network, I will never know. Guy was cordial and accommodating. He actually lit up when I asked him about his appeal to children (my nieces and nephew, ages 12, 10 and 5, love him). Guy explained his process of talking to kids the same way he talks to adults, adding how important his own relationship to his children is. Most famous for his shows, like “Diners, Drive-Ins and Dives,” Ultimate Recipe Showdown” and “Guy’s Big Bite,” the Food Network star also admitted that he feels he’s living a dream beyond his expectation and he wants everyone to get the message that they can enjoy all their favorite foods as long as they remember moderation is the key to eating. 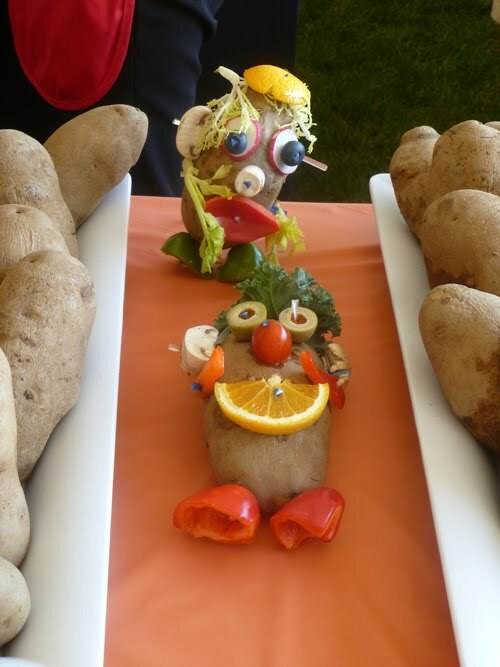 From the interview, I was off to my first event of the day, “Play with Your Food.” I wasn’t quite sure what to expect from this one and was pleasantly surprised. Pat and Gina Neely led kids – and adults – to everything from decorating real vegetables into Mr. Potato Head to making a healthy snack mix from granola, Chex, cranberries, nuts, seeds and M&Ms, all overlooking the Boardwalk between Bally’s and Caesars. From there the Neelys and I headed over to the Showboat Resort & Casino where the House of Blues Music Hall was the scene for “Blues, Brews BBQ." The Neelys welcomed the band and the guests to a great assortment of Artisan beers – from which my official tasters (I'm just not a beer gal) picked Ommegang Witte from Brewery Ommegang as their favorite, with a runner up to the gluten-free Quest Tripel from Greens -- and some grub from their Memphis restaurant. The brisket and cornbread stuffing were my favorites, but I didn’t eat too much because I knew my next stop was full of food. I had a little stop along the way, though, and that was to see a fellow wine and spirits lover, Darryl Robinson of Drink Up. 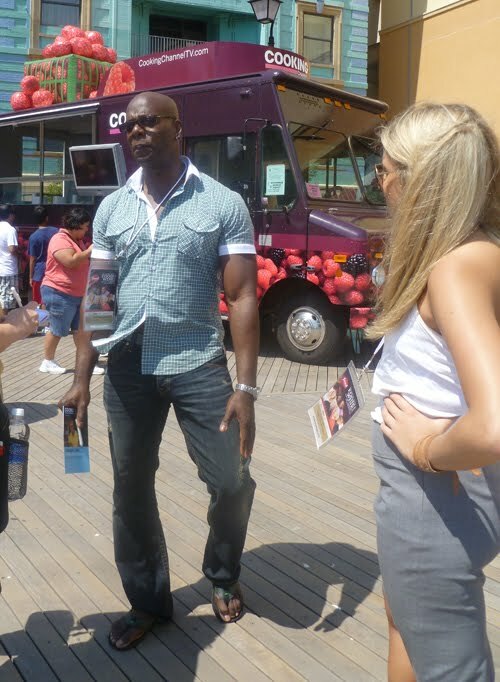 Darryl was actually out on the Boardwalk doing interviews and chatting with boardwalkers as the Cooking Channel’s official truck was giving out ice cream to cool down the crowd. We talked a bit about some drink trends. I asked him what he thought was weirdest trend lately and I agreed with his assessment that it was bacon in drinks. After I left Darryl, it was time for some imbibing of my own. I had been to the Grand Market at the Food Network’s South Beach event, so I had an idea of what to expect. This one was indoors, but was not lacking in an assortment of food and drinks. From chocolate chip cookies to cardboard containers filled with shrimp lo mein, there was more than enough food to keep the lucky ticket holders eating all day. It was also a perfect place to sample wine. There were more brands than I could count that came from everywhere, including some local New Jersey wines. It was my first sampling of Francis Ford Coppola's Wines. His Director’s Cut Cinema is definitely a winner which I will be looking for. I also stopped by the Van Gogh booth and tried a few flavors since I haven’t gotten to my sample pack at home yet. I didn’t realize just how extensive their collection was. Another thing I hadn’t tried yet and really enjoyed was Jeremiah Weed Sweet Tea. I really enjoyed it with some (non-alcoholic) iced tea and I’m anxious to try some of the Firefly I have at home ready for sampling. After Sam and I had filled ourselves as much as we could, it was time to head across the street to the Pier Shops at Caesars, where the Wine Down Art Show with Ted Allen was taking place. This was my first opportunity to check out the breathtaking views at One Atlantic, a window-filled space on the top floor of the shops. The photos only begin to do it justice and it was the perfect setting to watch the artists and sip yet another collection of wines. My favorites from this grouping included Provenance Vineyards Sauvignon Blanc from Rutherford, California, and the Fairview Pinotage from South Africa. There wasn’t time for my own wind down on day two of the Atlantic City Food and Wine Festival, but a break to change for the evening events to come. All photos by Samantha Frost, except top right photo of Marcia Frost, Guy Fieri and Samantha Frost by Rebecca Brooks.